BURGER LOUNGE is a favorite. As 2015 approaches, it’s common to reflect on the year that passed. For me, that involves remembering particularly flavorful meals. Since a monthly column inevitably leaves gaps in my gastronomic reportage, this month I’ll share highlights from restaurants I didn’t have an opportunity to review before. Rustic Canyon Wine Bar & Seasonal Kitchen serves innovative farmer’s market-driven recipes, and I crave one that combines two of my favorite foods: beets and berries. A beautiful purple-red, the star ingredients are tossed with avocado chunks, quinoa and pistachio “soil.” Bright and earthy, this deceptively simple dish is a must-have. 1119 Wilshire Blvd., Santa Monica, 310-393-7050. Din Tai Fung’s ethereal soup dumplings are a worldwide rage, but for a total hoot head to the San Gabriel Valley for Wang Xing Ji’s supersized version. The dough is coarser, the filling not as magnificent, but imagine a bamboo steamer stuffed with one seven-inch dumpling filled with soup, crab and pork. Impossible to pick up, this giant is served with a straw. Poke it through the dough, slurp the hot broth, douse the rest with chili sauce and enjoy. 140 W. Valley Blvd., San Gabriel, 626-307-1188. I almost never eat beef burgers. At home I’m the turkey burger queen, and if I’m going to indulge in a high cholesterol red meat treat I’d rather go whole hog, so to speak, and get a medium rare slab of steak. But ever since sampling it at The Taste of Larchmont, the classic burger from Burger Lounge has been calling out to me. 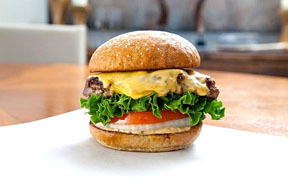 This grass-fed beef patty with melted American cheese on a supple bun is quite tasty, and worth a repeat performance. 217 N. Larchmont Blvd., 323-462-2310. Another yum-on-a-bun treat is the barbequed pork belly sandwich with slaw at Animal. Given the Fairfax restaurant’s tendency to surprise with the likes of spicy beef tendon chips and veal brains with apricot puree, it’s lovely to find a straight-forward and tasty ‘wich on the menu. Those who love raw oysters have probably experienced the fresh varieties proffered by The Oyster Boys, since they supply a host of LA seafood emporiums, but I’m partial to their oyster tastings at Domaine LA. There, alongside the champagne pours from the Melrose wine shop, I tried bivalve varieties I’d never heard of before, and they were spectacular. The next oyster event and bubbly tasting is on Sun., Dec. 7. Anyone who has escaped to Lake Arrowhead for a weekend respite will be happy to know that there’s finally a worthy restaurant in the mountain community. Stone Creek Bistro is a cute café with very good food, including amazing Brussels sprouts, crisp-fried, dressed with aged sherry-walnut aioli and sprinkled with bacon, parmesan and fresh thyme—what’s not to love? 26824 State Hwy. 189, Blue Jay, CA 92391, 909-337-3663. My year-end list wouldn’t be complete without the single most amazing dish I had all year, even though you’ll have to travel to Paris to try it. Bouillon Racine, an historic art nouveau restaurant, serves a gloriously smooth and rich cream of cauliflower and scallop soup. I keep meaning to try to replicate it at home—but part of me wants to save it for another visit to that beautiful city. 3 Rue Racine, Paris, +33 1 44 32 15 60.